Freecharge does full justice to its name. It never lags behind when it comes to great bill payment or recharge deals. It hosts prepaid, postpaid, DTH, metro recharge and utility bill payments for numerous service providers & is therefore widely used across the country. Today again, we bring you a great offer. Get Flat Rs 50 Cashback on Recharge/Bill Payment of Rs 50 or more i.e. free recharge worth Rs 50. How to get FREE recharge worth Rs 50? 1 . First of all, visit Freecharge here or download Freecharge App – Android | iOS. Few days back, we posted on how to get free recharge worth Rs 50. Today we are back with another bang. Get Flat Rs 100 Cashback on Recharge/Bill Payment of Rs 100 or more i.e. free recharge worth Rs 100. You heard that right. Offer is valid for selected users only. So, try your luck now. How to get FREE recharge worth Rs 100? 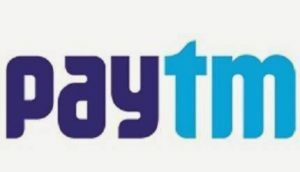 Paytm is back with free recharge of Rs 50. Selected users can now get flat Rs 50 Cashback on min Recharge of Rs 50 when paid using Paytm UPI handle. Must check if your account has this offer. You can get a free recharge worth Rs 50 for any operator. 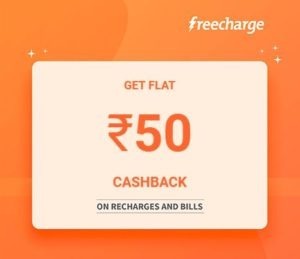 How to Get flat Rs 50 Cashback on min Recharge of Rs 50? With all the telecom companies launching recharges with validity, a recharge of min Rs 35 is necessary every month for every SIM to remain active. So, here we bring an offer to give you some relief. 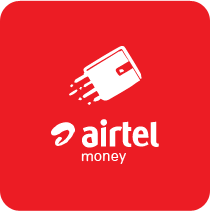 Get flat Rs 35 cashback on Recharge worth Rs 35 or above (All Operators) on My Airtel App. That means your this month’s recharge is on My Airtel App. This offer is applicable on prepaid mobile recharge of any operator. How to Get flat Rs 35 cashback on Recharge worth Rs 35 or above (All Operators)? Amazon Grand Indian Sale is live now. With lots of offers flooding, Amazon is also giving great offers on bill payments and recharges. Amazon Prime users can now get flat 100% cashback (up to Rs 100) on mobile recharges. How to Get Flat 100% cashback (up to Rs 100) on mobile recharges? 1. First of all, Go to Amazon. No balance? Wish to refill your prepaid balance or recharge your number with unlimited calling + data offers? 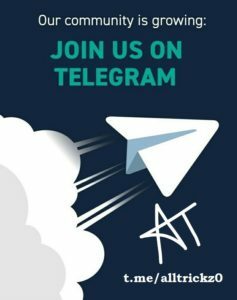 We’ve got some offers for you. 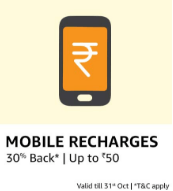 Get flat 30% cashback(up to Rs 50) on mobile recharge (all users) and get up to flat Rs 100 cashback (new users) with amazon. 1. First of all, visit Amazon.